The annual festivus of The Grammy Awards will be held on February 10th in Los Angeles, CA. This year’s entry includes Etana representing the first woman to be nominated for a Reggae Grammy award. 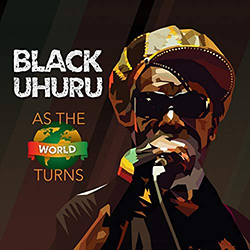 Black Uhuru, currently lead by original member Duckie Simpson, releases ‘As The World’ - their first release in 15 years. The power duo of Winta James of Ovastand Entertainment and Protoje join forces for his 5th release - ‘A Matter of Time’. The album is anchored with James’ single production style and once again joins forces with Reggae Revival counterpart Chronixxx. In the most unpredictable release of the year, regardless of genre, is the collaboration of Sting and Shaggy. Guest vocalists on the project include Aidonia and Morgan Heritage. While not ‘Rootsy’ or succumbing to standards of Reggae production, the “44/876” album is a good listen. While not in heavy rotation on the program, ‘Rebellion Rises’ from Ziggy Marley holds firm to commercial and industry success. This is Ziggy’s 8th album.